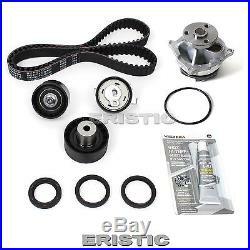 2000-04 Timing Belt Water Pump Kit Ford Focus Mazda Tribute 2.0L DOHC "ZETEC". 2001 - 2004 FORD / MAZDA. 2.0L(1989cc) DOHC L4 16V, "ZETEC". Brand New Timing Belt Kit & Water Pump Set. 2001 - 2004 FORD ESCAPE 2.0L DOHC L4 16V, VIN CODE "B". 2001 - 2004 FORD FOCUS 2.0L DOHC L4 16V, VIN CODE "3, 5". 2001 - 2004 MAZDA TRIBUTE 2.0L DOHC L4 16V, ENG. 1 Timing Belt (129 teeth). 1 Timing Belt Tensioner (Bearing Assembly). 1 Idler Bearing 60mm O. 1 Water Pump Set Incl. THE TEAM ARE HAPPY TO HELP. &###x200B;&###x200B;&###x200B;&###x200B;&###x200B;&###x200B;&##x200B. Discount for multiple items is available. We strive to provide 5-star customer service. Opened or installed parts will not be accepted. The above limitations may not be applicable in your states. We are here to help you. CODE "ZETEC" PACKAGE INCLUDES ---1 Timing Belt (129 teeth) ---1 Timing Belt Tensioner (Bearing Assembly) ---1 Idler Bearing 60mm O. Bearing ---1 Water Pump Set Incl. The item "2000-04 Timing Belt Water Pump Kit Ford Focus Mazda Tribute 2.0L DOHC ZETEC" is in sale since Thursday, July 11, 2013. This item is in the category "eBay Motors\Parts & Accessories\Car & Truck Parts\Engines & Components\Timing Components". The seller is "eristicgaskets" and is located in South El Monte, California. This item can be shipped worldwide.